In the NP system, we work with the Spirits to get closer to God. This is called theurgy. Iamblichus, a student of Plotinus, taught that working with the Spirits was a means to purify the sphere of the magician, to make it more like the creator and less like the created. He recognized that when you conjure up a Spirit of Mars, you’re working with something on a higher level, and that something has emanated something into what eventually manifested as you. As it is more pure, its very presence close to your sphere purifies your own sphere, restoring a bit of the awareness of your own divinity as it relates to the powers over which that particular spirit presides. in all theurgical operations the priest sustains a twofold character; one, indeed, as man, and which preserves the order possessed by our nature in the universe; but the other, which is corroborated by divine signs, and through these is conjoined to more excellent natures, and is elevated to their order by an elegant circumduction, this is deservedly capable of being surrounded with the external form of the Gods. The answer is that while yes, we are in matter, we are of two parts, the divine and the flesh. The divine aspect of the self has existed since before time within the One, God, who emanated down through all the spheres and beings and elements and stuff-ness of everything. The flesh part is the temporary shell of the divine spirit, and while it is lower in the cosmic hierarchy, the spirit within is still in authority. 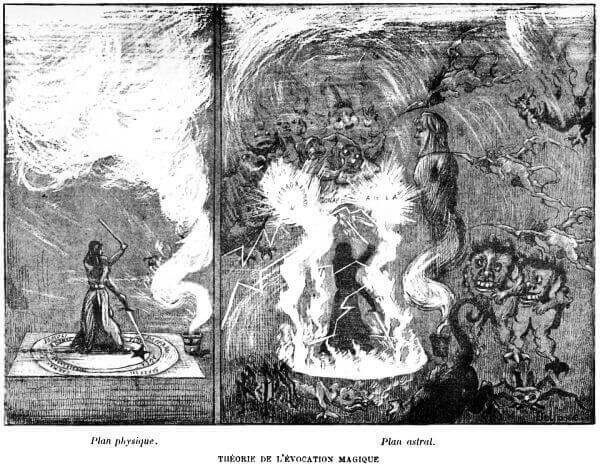 Therefore, the magician surrounds the material part of themselves with the symbols of the divinity within, and petitions the higher spirits to appear using the classic conjuring orations from such sources as the grimoires. The Spirits (and I’m including the “gods”, angels, daemons, elementals, or whatever else you would call them in your branch of the Western Mystery Tradition) appear in response to the conjurations because they have a vested interest in us. They are also aspects of the One within us. However, they are of a different form, and in that form they don’t have the same capacities that we do. Once they appear, the differences in the nature of our emanation place us in a position of authority over the spirits, and we are therefore able to “command” the spirits to do our bidding. Now, the basic formula for conjuring the spirits is pretty simple. You surround yourself with the things the spirit has an affinity for. Each Spirit is responsible for emanating an aspect of the One into the material realm. Michael, Archangel of the Sun, is responsible for emanating the things that manifest with a solar nature in the material realm. You surround yourself with the things that have solar properties to get his attention, and conjure him in the name of God that describes his function. Now, as a ceremonial magician, the best thing you can have that Michael has emanated into the material realm is his Arch-angelic Seal that he revealed to magicians. His Name itself is the means he revealed himself to this realm. The names of God that are associated with him are also revealed by Michael into this realm in order to establish contact with him. When Michael appears, you explain your need, remembering that yes, he is superior to you in some ways, but at the same time, you are his boss (in a VERY spiritual way). That is to say, the Logos within you is the same Logos Michael receives his orders from. If you’re commanding the Spirits from the authority of the part of yourself that is the flesh, you’ll get no results. As a Christian, I know that I have been “Born of the Spirit,” and my work with my HGA has resulted in certain “initiations” that grant me the awareness of my Roles and Responsibilities in the cosmic Hierarchies, so I’m getting pretty consistent results. Not always pleasant from the mundane perspective, but always beneficial. Have the seal of the spirit. Thank the Spirit, and bid it to go and do as it agreed. Pretty simple, eh? The rest of the details of the various grimoires and such are cultural necessities. That means that when the Almadel has you make a Beeswax Angel Conjuring Device, you make a Beeswax Angel Conjuring Device if you expect to work with the spirits of the Almadel. If you’re OK with working with something that MIGHT be LIKE the spirits of the Almadel, you’re free to make your own adaptations, but the results are not guaranteed. I must stress, you have to know the rules before you can break them. The three stages of Classical Education are Grammar, Logic, and Rhetoric. Grammar teaches the basic building blocks, Logic teaches how the building blocks are assembled, and Rhetoric is the stage where you demonstrate your understanding of the pieces and parts by assembling them in new ways. The Grimoires themselves contain the elements of the Grammar stage. Lists of spirits. Means of contacting them. Performing the instructions in the Grimoires brings you in touch with the Spirits, who teach the Logic stage. After you’ve been “initiated” you advance to the Rhetoric stage, and you can make things up based on your knowledge and understanding gained from research AND experience. I’m not advocating Chaos Magick, but I’ve grown to recognize the elements of Chaos Magick that are true in certain contexts. What gets on my nerves is that Chaos Magick doesn’t give magicians the context necessary for success. :sigh: I’ve ranted on that elsewhere.